Originally known as Decoration Day, May 30 was established as a day to remember those who died in the American Civil War. After World War I, Memorial Day came to be the day we remember the American dead of all the wars our country has been involved in. In 1971, Congress established Memorial Day as a national holiday and changed its observance to the last Monday in May, resulting in a three-day holiday weekend. Here are excerpts from sites with information about the history of Memorial Day. Established by Congress in 1923, the American Battle Monuments Commission (ABMC) commemorates the service, achievements, and sacrifice of U.S. armed forces. 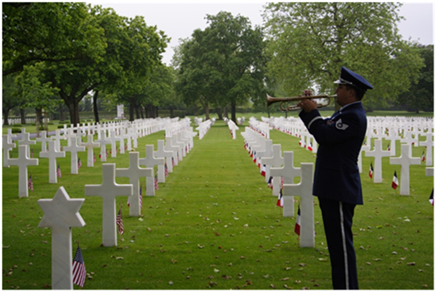 ABMC manages 24 overseas military cemeteries, and 25 memorials, monuments, and markers. Nearly all the cemeteries and memorials specifically honor those who served in World War I or World War II. The sacrifice of more than 218,000 U.S. servicemen and women is memorialized at these locations. Nearly 125,000 American war dead are buried at ABMC cemeteries, with an additional 94,000 individuals commemorated on Tablets of the Missing. So on Memorial Day each year, we remember the men and women who died and were buried on American soil as well as on the battlefields of World War II, the Korean War, and the Mexican War. Most of our soldiers from Vietnam, Afghanistan, and Iraq have been brought home to be buried. We owe a great debt to our fallen heroes for defending our homeland and fighting for our liberties. May we never forget the sacrifices they have made for us.